Why Announce a Camera You Can’t Get? Really, How Hard is it To Grind Some Metal? Was it Announced or Not? EOS M2 - Japan Only? "NEX" is Gone, so What do we Call It? Whoa! What the Heck Happened? Do the NEX models really overheat? 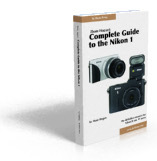 This section contains short first impressions of cameras currently being evaluated for review. As reviews are finished, relevant comments that still apply will be rolled from the first impressions article to the review and the first impressions article will be removed.